There are Plone chat rooms used by our friendly and vibrant community of volunteers, including users, designers, integrators and developers. Please do not use chat to ask for support. Support questions should be directed to either the volunteers in the Plone forum or commercial providers. GSoC students: do not use chat. To introduce yourself or to ask questions on how to get started, please use our forum and follow the instructions for interested GSoC students. If you have run into a problem and require help, please post your questions to our forum, and include as much detail as you can (operating system, version of Plone, version of any add-ons, the exact commands you ran, and the full error message text). Please remember: forum participants are volunteers. If you require immediate production support, please contact one of the commercial Plone providers listed at Plone.com/providers. 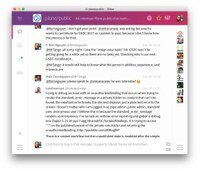 Plone uses chat services to foster its sense of community. All are welcome to drop in, join discussions, and ask general questions! Gitter is the best way to interact with the Plone community. Gitter offers a user-friendly way to chat, with enhancements such as off-line responses, notifications and indexing of discussions. Please be aware that you will be chatting with volunteers. The best way to sign on to Gitter is via your GitHub account. You can also use Facebook and Twitter logins, but we highly encourage you to use GitHub instead. Plone uses GitHub for its code, documentation, training materials, and issue tracking. Please do not use IRC to ask for support. Support questions should be directed to either the volunteers in the Plone forum or commercial providers. #plone-ai - Admin & Infrastructure team. Show traceback errors. Copy and paste the entire traceback error in pastie.org or similar service and provide the link to your paste. Keep the chat window open for at least 30 minutes and be patient. Please do not repeat your question — people might be busy or unable to help with your specific problem. Silence doesn't mean we're ignoring you! It means nobody available knows the answer to your question. "When I start Zope in debug mode I get the following log entry. I pasted the log to pastie.org and here is the link for the log entry http://pastie.org/123123"
"Hi, I'm using product XYZ on Plone 4.0.1, I have a problem with the feature that is supposed to doABC— I get error BlahBlahError — what might be wrong? Here is a link to the error log on pastie.org:http://pastie.org/123123">"
If you need any additional help, e.g. changing the channel topic or anything else, ask for an operator.